Aqua/Water/Eau, Propylene Glycol, Glycerin, Glycereth-7, Dimethicone, Glycosaminoglycans, PEG-12 Dimethicone, Carbomer, Triethanolamine, Imidazolidinyl Urea, Phospholipids, Panthenol, Parfum/Fragrance, Zinc PCA, Tocopherol, Sodium Metabisulfite, Potassium Sorbate, Benzophenone-4, Tetrasodium EDTA, Maris Sal/Sea Salt/Sel marin, Magnesium Nitrate, Disodium EDTA, Crithmum Maritimum Extract, Fucus Vesiculosus Extract, Undaria Pinnatifida Extract, Ulva Lactuca Extract, Tocopheryl Acetate, Methylchloroisothiazolinone, Methylisothiazolinone, Magnesium Chloride, Retinyl Palmitate, Leuconostoc/Radish Root Ferment Filtrate, Diazolidinyl Urea, Phenoxyethanol, Methylparaben, Butylparaben, Ethylparaben, Propylparaben, Isobutylparaben, Linalool, CI 42090/Blue 1. This stuff really inflamed my acne. Not suitable for undermakeup. Thick, jelly consistency. Whatever fragrance in it was irritating. Hate the entire line, too! Without question the only moisturizer that works for normal to oily acne prone skin. It is one of the most moisturizing gels, but also extremely light. In the winter I switch to the Ultra hydrator. Highly rated by beauty magazines as well. If you have extremely oily skin, use the Sea Matte line. Slightly pricey but there is NO neutrogena/clean&clear, clinique/proactive equivalent. 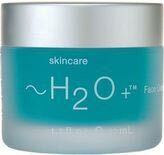 Recommended by my cousins in Toronto 10 years ago as the only brand that cleared their acne, my sister and I have different types of acne but H2O has drastically improved our skin. Get - a marine cleansing gel - marine toner - oasis hydrating gel - and the MUST have is the Sea Results Overnight Perfecting Peel. Nothing else has worked this well at texture, acne and pore size control. I have been using this for years and have gotten friends onto it who swear by it. I've tried Clinique, Acne.org, Proactive. H2OPlus - if you only get their moisturizer- is groundbreaking.